AMONG the most successful British express passenger locomotives are the Pacifics of the London, Midland & Scottish Railway. One of these, No. 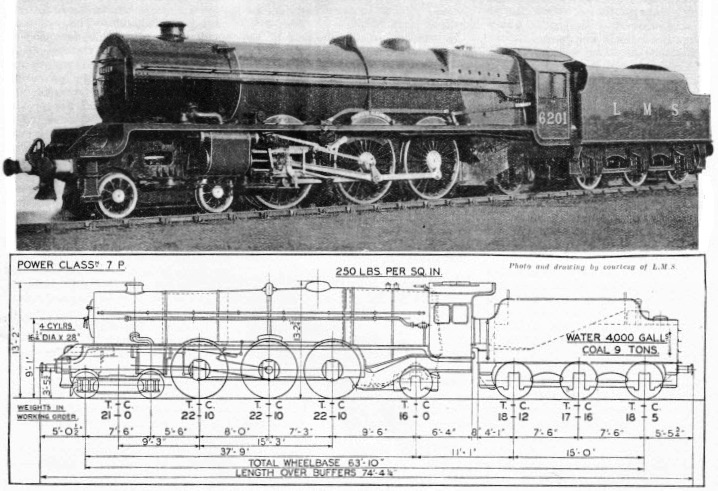 6201 Princess Elizabeth, is illustrated above. This engine was built in 1933. The standard engines of this type are four-cylinder simples. The cylinders have a diameter of 16¼ in and a stroke of 28 in, actuated by Walschaerts valve-gear, with 7¼ in travel. The six coupled wheels have a diameter of 6 ft 6 in; the bogie wheels are 3 feet and the trailing wheels 3 ft 9 in in diameter. 3-in. It has a working pressure of 250 lb per sq in. To the total heating surface of 2,937 sq ft the tubes contribute 2,097, the firebox 217 and the superheater 623 sq ft. The firegrate area is 45 sq ft. Tractive effort, at 85 per cent boiler pressure, is 40,300 lb. The engine weighs 104 tons 10 cwt in working order. The weight on each coupled axle is 22 tons 10 cwt, giving a total of 67 tons 10 cwt available for adhesion. The tender runs on six wheels, each of 4 ft 3 in diameter. It has a coal capacity of 9 tons and a water capacity of 4,000 gallons. Its weight full is 54 tons 13 cwt. The weight of engine and tender in working order is 159 tons 3 cwt. One of the most spectacular performances achieved by any of the LMS Pacifics was that of No. 6201 Princess Elizabeth, on November 16 and 17, 1936, when the world's record for fast long-distance steam-hauled running was beaten on two successive days. On the down journey, on November 16, Princess Elizabeth, hauling seven vehicles weighing 225 tons, ran without a stop from London (Euston) to Glasgow (Central), 401.4 miles, in 5 hours 53 minutes 38 seconds, at an average speed of 68.1 miles an hour, including about fifty service and permanent way slacks. The return journey, on November 17, was even faster. With one extra vehicle and a load behind the tender of 255 tons, the locomotive, again subject to about fifty slacks, ran from Glasgow to Euston in 5 hours 44 minutes 15 seconds, at an average speed of 70 miles an hour. These high average speeds were attained by dint of exceptionally fast uphill running rather than record-breaking on the level and downhill. The highest speeds were 95½ miles an hour on the down and 95 miles an hour on the up journey. Neither locomotive nor coaches were streamlined for these high-speed experimental runs.